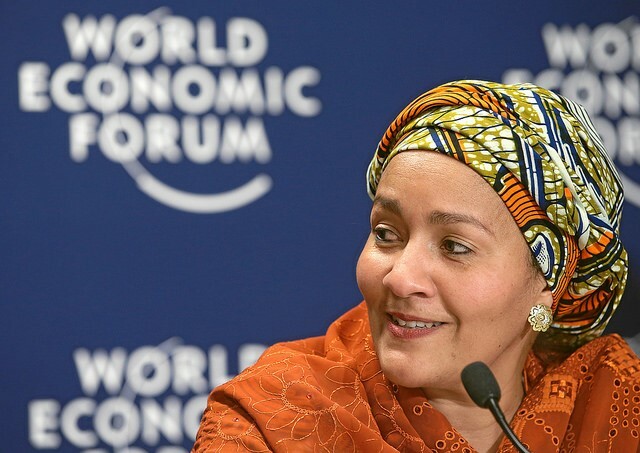 Dr. Amina J. Mohammed is a key player in the post-2015 development process, serving as the Special Adviser to UN Secretary-General Ban Ki-Moon on post-2015 development planning. In this role, she acts as the link between the Secretary-General, his High Level Panel of Eminent Persons (HLP), and the General Assembly’s Open Working Group (OWG), among other stakeholders. Prior to this position, Ms. Mohammed served as Founder and CEO of the Center for Development Policy Solutions and as an Adjunct Professor for the Master’s in Development Practice program at Columbia University. Previously, she acted as the Senior Special Assistant to the President of Nigeria on the Millennium Development Goals after serving three presidents over a period of six years. In 2005, she was charged with the coordination of Nigeria’s debt relief funds toward the achievement of the MDGs. From 2002-2005, Ms. Mohammed coordinated the Task Force on Gender and Education for the UN Millennium Project. Drawing from her experience managing Nigeria’s domestic work toward the MDGs, Ms. Mohammed is an advocate for practical solutions that member states can actually implement. She has also emphasized the importance of good governance and strong institutions, as she saw these to be crucial foundations for her work in Nigeria. As a leader from the global South herself, Ms. Mohammed hopes that member states see this next agenda as an opportunity to dig deeper and aspire to a set of common ideals rather than a prescription from north to south. From the beginning of the process, she has worked diligently to combine poverty alleviation and environmental sustainability into one comprehensive agenda rather than seeing them as competing priorities. Ms. Mohammed has conducted extensive consultation with leaders from civil society, social movements, the private sector, trade unions, think tanks, academia, and other stakeholders, and then worked to synthesize these voices in her recommendations to the Secretary-General. What can we expect from her, going forward? In the coming months, Ms. Mohammed will be spearheading efforts to produce a synthesis report combining recommendations from the OWG, a UN Committee of Experts on Sustainable Development Financing, as well as an array of other relevant inputs from across the globe. This report will then be presented to the UN General Assembly towards the end of 2014 and will serve as the basis for the following year of intergovernmental negotiations. As the next development agenda takes its final shape over the coming year, we can expect Ms. Mohammed to continue to push for issues that are important to her, including a focus on people-driven development, ensuring effective implementation on the country level, bridging political divides, pushing for stronger institutions, and harmonizing poverty and environmental concerns. Photo courtesy of the World Economic Forum. Sarah Carson is a researcher with the Project on Prosperity and Development at CSIS.